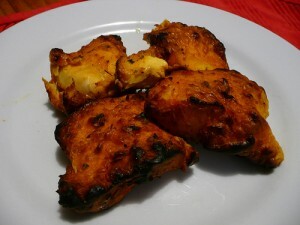 Fish Tikka recipe by Samar at DesiRecipes.com. Wash the fish without bones then dry with cloth, cut into medium size pieces. Grind garlic and ginger finely. rub on the fish pieces and keep for one hour. Stick on iron rod, then put on medium fire of charcoal grill. Turn them frequently or grill untill nicely browned. Serve with mint chutney and rice. Sounds Yummy, will gjve 5stars after I make it and result come out good.